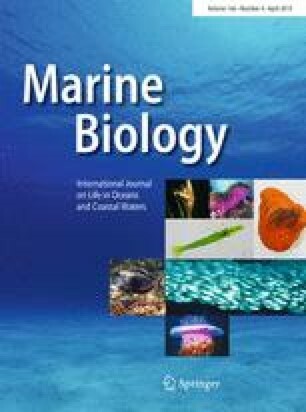 Many marine gastropods show species-specific behavioral responses to different predators, but less is known about the mechanisms influencing differences or similarities in specific responses. Herein, we examined whether two limpet species, Scurria viridula (Lamarck, 1819) and Fissurella latimarginata (Sowerby, 1835), show species- and size-specific similarities or differences in their reaction to predatory seastars and crabs. Both S. viridula and F. latimarginata reacted to their main seastar predators with escape responses. In contrast, both limpets did not flee from common crab predators, but, instead, fastened to the rock. All tested size classes of both limpet species reacted in a similar way, escaping from seastars, but clamping onto the rock in response to crabs. Limpets could reach velocities sufficient to outrun their specific seastar predators, but they were not fast enough to escape crabs. Experiments with limpets of different shell conditions (with and without shell damage) indicated that F. latimarginata with a damaged shell showed “accommodation movements” (slow movements away from stimulus) in response to predatory crabs. In contrast, intact F. latimarginata and all S. viridula (intact and damaged) clamped the shell down to the substratum. The response details suggest that the keyhole limpet F. latimarginata is more sensitive to predators (faster reaction time, longer escape distances, and higher proportion of reacting individuals) than S. viridula, possibly because the morphology of F. latimarginata (the relationship of its shell size and structure to its total body size) makes this species more vulnerable to predation. Our study suggests that chemically mediated effects of seastar and crab predators result in contrasting behavioral responses of both limpet species, independent of their habitat and morphology. Despite the different characteristics of the limpet species and the identity of predators, the limpets react in comparable ways to similar predator types. Reviewed by P. Camus and A. E. Scherer. We are most grateful to S. Boltaña and I. Hinojosa for their help in the field, and to C. Correa who kindly provided the velocity data for M. gelatinosus. Our special thanks go to J. Long, who gave many helpful comments on an early version of the manuscript. This manuscript was substantially improved by numerous constructive comments from four anonymous reviewers and the editors. We greatly appreciate the critical review provided by T. Manzur who commented on the final version of the manuscript, and we thank L. Eastman for editing the English of the final manuscript. MT and MW conceived the study. MW conducted the field and laboratory experiments. MAA reanalyzed all data and led the writing of the revised manuscript, which had been initially prepared by MT and MW.